The heart and soul of a good company is the creativity it brings to a marketplace. Innovation (as we’ll call it) is both the knowledge a business bestows to an industry and also the imagination in which it approaches its products and customers. In many ways, 2014 has been a tough year for contractors and manufacturers, so now it seems like an appropriate time to celebrate some of the big success stories — contractors who have become leaner and more agile, companies that have diversified and gained market share and manufacturers who have kept trailblazing with ever more efficient and innovative equipment. With this article we salute the companies (from Cat to Kubota) that have changed the commercial equipment market over the last 12 months with their unique, interesting and innovative machines, engines and technologies. Let’s list the many class-leading capabilities of the Boxer 120 trencher. 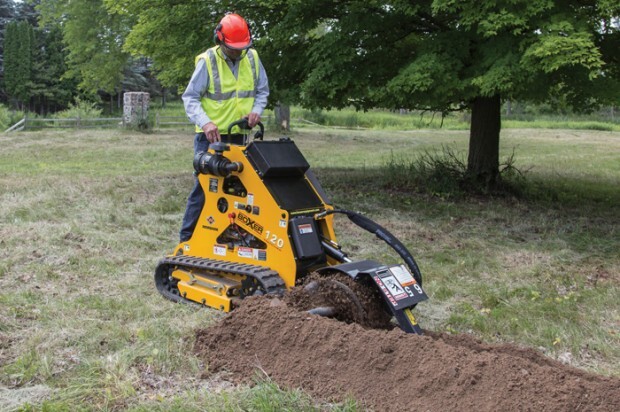 In a world of walk-behind trenchers, the 120 trencher is the only unit designed as a ride-on unit, allowing better visibility to the trencher assembly and the job being completed. The 120 trencher is the only unit in its class to feature a planetary trencher drive. The 120 trencher is also the only unit in its class to feature a spring loaded trencher boom and standard crumber assembly; the spring loaded trencher boom is designed to absorb the shock load impact to reduce head shaft stress and minimize chain wear. The 120 trencher is the only to unit in its class to feature independent track drive controls with all controls accessible for two-hand operation. For more info, visit boxerequipment.com. Keith Gribbins is associate publisher of Compact Equipment, based in Brecksville, Ohio.